Traumatized and depressed, a 24-year-old girl decided to commit suicide when her boyfriend left her. After getting a government job, the boy came under family pressure and left the girl. After such a drastic incident, all that the girl could think of was suicide. She decided to end her life by jumping in the Yamuna canal which is 4km away from Saharanpur. While she was about to jump, second thoughts started coming in her mind and she decided to opt for an easier way to die. So like a normal person, she turned towards Google for help. The search results, including that of suicide helpline numbers, led to her considering other options. She ultimately ended up calling the office of the deputy inspector general of police. The officer heard her out and convinced her to go in for counseling instead. 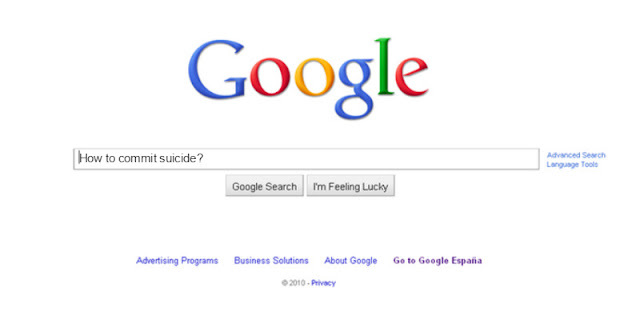 Google does not immediately show options when someone types "how to commit suicide". However, it throws up a host of sites and numbers to contact, including helplines such as that run by Aasra, a crisis prevention center. Technology saved this girl’s life and Google should get all the appreciation for listing suicide helpline numbers for such searches instead of the methods.